MOY made the trip to Coney Park to take on Ardboe and they came away with the two points on a 2-10 to 1-12 scoreline. It was the Rossas who led by two points at halftime with full forward Shay McGuigan hitting 1-3, Sean Cavanagh and Michael Conroy on target for Moy. Cavanagh punched in an early second half goal to enable Moy to get their noses in front but back came Ardboe with points from Kyle Coney and McGuigan as the lead changed hands again. With five minutes to go Conroy held his nerve to convert a penalty after he had been fouled himself and while McGuigan responded for the Rossas efforts from Coleman and Cavanagh saw the visitors take the spoils. Derrylaughan played host to Coalisland at the Loughshore and it finished honours even, 0-17 to 1-14. The Kevin Barrys had the wind at their backs in the first half but it was the Fianna who enjoyed a five point advantage at the short whistle. Cathair bagged the only goal of the game with Paddy McNeice, Stephen McNally, Liam Gervin and Fergal McAliskey providing points for their respective sides. McAliskey and Sean Corr traded points on the restart before the hosts closed the gap with another three scores from the former. McNeice, Plunkett Kane and Bailey Leonard then all registered as the visitors moved three clear with time running out. 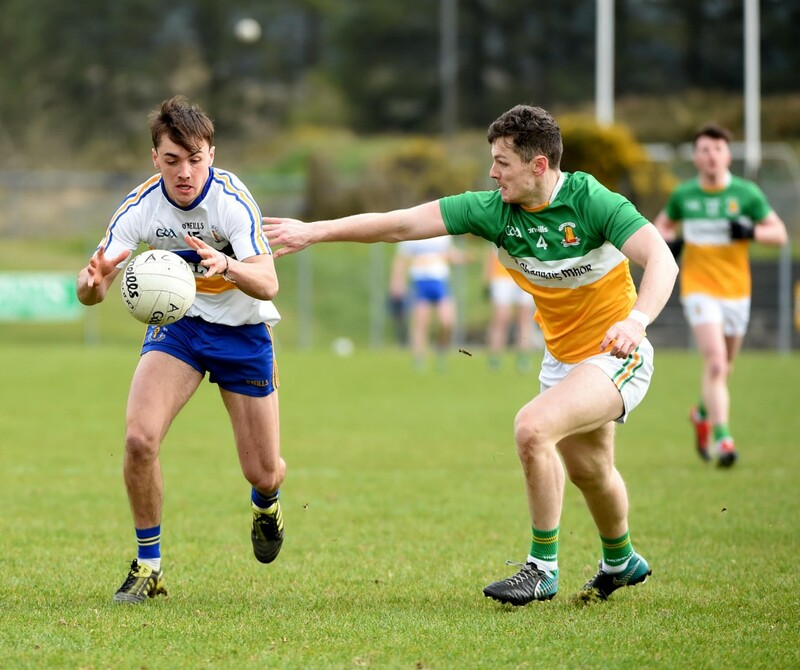 To their credit though Derrylaughan refused to accept defeat and three late frees from the accurate boot of McAliskey earned them a deserved share of the spoils. Newly promoted Eglish entertained Dromore and it was the St.Dympnas who came out on top in a high scoring encounter. It was nip and tuck throughout the opening period with the visitors managing to shade things 0-8 to 0-7 thanks to points from Sean McNabb, Tiernan Sludden and Emmett McNabb, Seamus Muldoon and Peter McCann on target for the home side. Emmet McNabb, Niall Sludden, Ciaran McCoy and Caolan Slevin all tagged on second half points for the winners after Eglish had drawn level on the restart, Emmet McKenna and Ethan Jordan with scores for the St.Patricks. Elsewhere, Omagh got off to a flyer with a nine-point win over Donaghmore while Clonoe defeated Edendork by 0-15 to 0-9. Trillick scored a 1-18 to 0-6 win over newly promoted Tattyreagh with Mattie Donnelly on top form, while Darragh Canavan and Peter Harte performed wonders in Errigal’s 4-13 to 0-11 win over Carrickmore. Perhaps the story of the day, however, was Dungannon Clarke’s win over Killyclogher on a scoreline of 1-12 to 0-14. Pick up a copy of Tyrone Herald tomorrow for extensive coverage from all three Divisions.